Forever protected as a free-flowing river, the Buffalo was the nation's first national river. With headwaters in Newton County, it flows eastward 135 miles through Newton, Searcy, and Marion Counties before uniting with the White River at the Baxter County line. 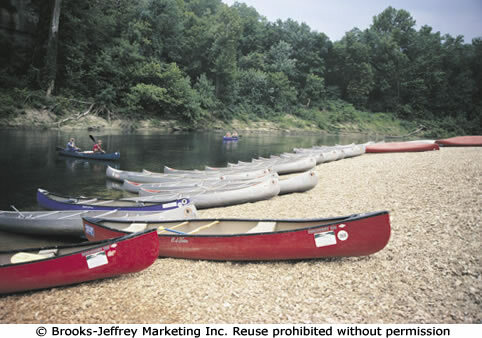 For information on services and accommodations provided by Buffalo National River canoe outfitters and shuttle services, call the National Park Service at (870) 741-5443. 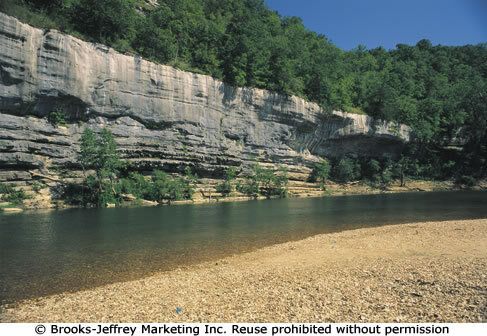 Whether you're set for the thrilling challenge of white water, the calming serenity of a "no work" float, or some angling for smallmouth bass, you'll be captivated by the beauty of the clear, clean river winding around the steep rock bluffs. The term "floating" refers to boating and canoeing on our rivers, and it can include fishing as you float. Contact river outfitters for a "float" trip on the Buffalo.